A judge said he would allow attorneys for the plaintiffs — survivors and those who lost family or property in the slide — to bring up the deletions in opening statements Monday and in jury instructions. 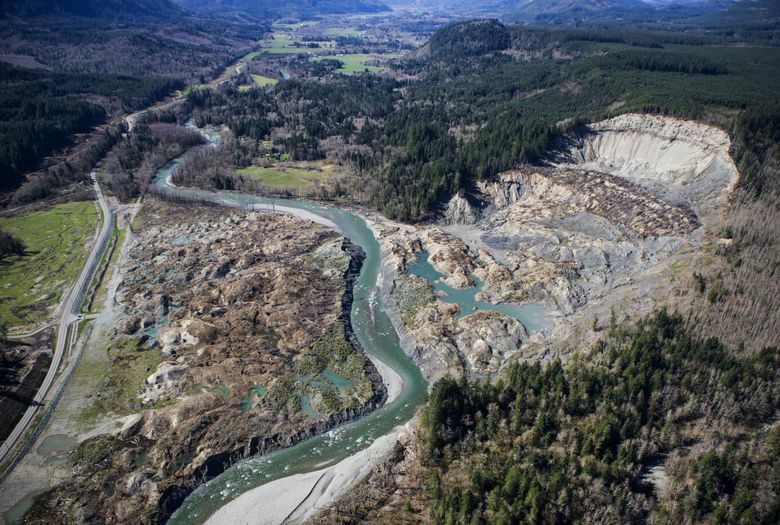 When the civil trial over liability for the 2014 Oso landslide finally gets under way Monday, it won’t take long for the jury to learn about the improper deletion of emails by expert witnesses hired to help defend the state. King County Superior Court Judge Roger Rogoff said last week he would allow attorneys for the plaintiffs — survivors and those who lost family or property in the slide — to bring up the deletions in opening statements. Jurors will be reminded of the issue at the end of the trial, too, as they head off to deliberate whether two landowners — the state and a Skagit County-based timber company — bear any liability for the March 22, 2014, disaster that killed 43 people. The state and Grandy Lake Forest Associates, which owned timber lands in the area, are defendants in the case. The judge approved the instructions that say jurors may, but are not required to, infer the deleted emails held information that would have been harmful to the state’s case. The judge’s decisions underscore the extent to which the emails will cast a shadow over the state’s defense in what is expected to be the highest-stakes civil-liability trial in Washington state history. A settlement remains a possibility, and the rulings aid the plaintiffs as they seek a large payout. These rulings, along with a fine Rogoff will impose later, reflect his dismay at finding that lawyers working for the state knew about the email deletions and did not stop them or disclose them to the plaintiffs’ attorneys. “This doesn’t happen very often. But the nature of the court’s instructions are standard when you have a situation as serious and harmful as this one,” said Darrell Cochran, a plaintiffs’ attorney. Both the state and timber-company attorneys, in court filings, have repeatedly denied that any actions on their land elevated landslide risks or aggravated the damage. The plaintiffs argue that logging on Grandy Lake Forest Associates land boosted the risks by increasing runoff and making the property more vulnerable to landslides. The plaintiffs’ attorneys allege that a crib wall fence built on state property retained loose soils from earlier landslides, and thus increased the ability of the leading edge of the massive 2014 landslide to race as it did across the North Fork of the Stillaguamish River and hit the Steelhead Haven neighborhood. The emails that got deleted were sent among forestry engineers and other technical experts who were paid more than $3 million to develop a key document in defense of the state. When they take the witness stand, the plaintiffs now will get to question them about the email deletions to try to undermine their credibility. The email deletions do not involve Grandy Lake. Plaintiffs’ attorneys hope a jury verdict in their favor could result in damages of more than $100 million. The trial is expected to last some three months. Settlement talks have occurred, and could take place even once the trial begins. To reach a settlement, the plaintiffs must reach accord not only with the Attorney General’s Office, but also the two insurers, AIG and Allied, who Cochran says have been slow to come to the table. Under the terms of the state insurance, the state is responsible for the first $10 million in any damages, according to state officials. AIG would be responsible for paying the next $40 million, while Allied would be responsible for up to $35 million in any additional damages. The state also would be responsible for any costs beyond $85 million. A spokesman for the Attorney General’s Office declined to comment on the prospects for settlement negotiations.